Romeo and Juliet- Rose Theatre, Kingston Sublime Shakespeare. Urgency opens Sally Cookson’s problematic Romeo and Juliet as in a sublime introduction, the opening prologue is narrated by the cast in half guttural whispers as they move their bodies in spasmodic jerks to the shuddering synth beats of Benji Bower’s epic score set against Aideen Malone’s Rothko- esque lighting. The play’s problematic and we all know why- the let down of a postal service that seems strangely modern helps Romeo and Juliet continue their trajectory towards certain death. Yet we don’t feel that that narrative ploy matters here. Instead of feeling despair at the turn of events that the missing letter provokes, we already feel- in fact know– that the emphasis is on parent and child and that the play’s downward spiral towards tragedy is the fault of the harsh, unseeing, blinded revenge racked adults, who, Maureen Beattie in particular as Capulet, rack up menace and violence by degrees as much as Romeo’s blank verse becomes more eloquent in the face of true unconditional love on Katie Syke’s brutalist stage. We live in times where so much emphasis is on the child and the abuse of the child’s rights by an adult and in this version, the stage serves not only as an example of brutalist architecture and makes us think of a crypt or a vault, but also of a child’s cityscape playground- Romeo and his young friends run, jump and leap around it as if free runners. This Romeo and Juliet could be for the skate board generation who hang out in the undercroft of the Southbank- the familiarity only adds to the production’s hot blood pumping sense of thrill, we could be on London’s streets by the walls of Waterloo bridge or shinnying up the rooftops in the spirit of urban explorers. There is no doubt that this is a radical production- an underlying pertinent theme is the carrying out of radicalisation by older female adults towards the younger children. Sharon D Clarke as the Nurse in particular applies. But some characters are also cut or meshed into one- there is an emphasis on the violent woman- Maureen Beattie morphs into a husband and wife Capulet and becomes a towering inferno of rage at Juliet’s refusal to marry Paris. Even as Juliet repents, her harshness, her belief that she is right in her daughter’s affairs, does not abate- and rather than give us scenes of physical violence (although Capulet throws Juliet around on stage a little) the emphasis is on the power of the word- not its meaning but its emotional tone and the way in which Maureen Beattie controls her body and reshapes it to get behind ‘beg, die in the streets’ for example. There are other interesting changes too- Mercutio is played by Laura Elphinstone and dresses like a hard wired punk female who constantly encourages Romeo to fight; even in death her and Tybalt (Felix Hayes) hang like subdued harpies as if malevolent energies intent on spurring the play’s vengeful drive…and in a sign that forces control from beyond the grave, Tybalt hands Juliet her suicidal knife. Juliet (Audrey Brisson) sings like a choirboy and looks like one, her Juliet is one who goes to her death almost without realising- she is not obsessed by it- that is not the point in this production- and nor is Joseph Drake’s intense street kid Romeo- it is the others around them who are and through the youthes, project their own death wish. In the program notes Sally Cookson writes that she looks ‘for a way to emphasis themes and ideas visually’. Along with movement director Dan Canham, not only has she found a way to express the emotion of the text through body and not just word, she has found a visual solution to emphasize again and again that the tragedy is inherent and inherited, by insisting on using the cast like a Greek chorus and employing ensemble story telling at key moments to remind us of the play’s cultural values from which Romeo and Juliet cannot, cannot escape. It is as though those two disparate elements- young love thwarted by the violent energies of those around them through the means of a narrative oddity (the missing letter) are finally brought together and resolved through tapping into the play’s metaphorical possibilities. There are some scenes left out- and some traditionalists make balk at this. But we know the production draws on Prokofiev’s ballet version as well as perhaps film versions and it should be seen for a passionate reworking of the play’s emotional undertones to provide a sense of cultural conditioning, rather than a total reliance on the word. And not since seeing Daniel Kramer’s Pictures at an Exhibiton, Cheek by Jowl’s Ubu Roi at the Barbican or Ivan van Hove’s A View from the Bridge, have I been so excited and exhilarated by a piece of theatre to such an extent that I do not wish it to end. But end it must as the cast reach their almost death rattle like conclusion in a production that should take your breath away, with its oddly restrained brilliance and sublimeness. 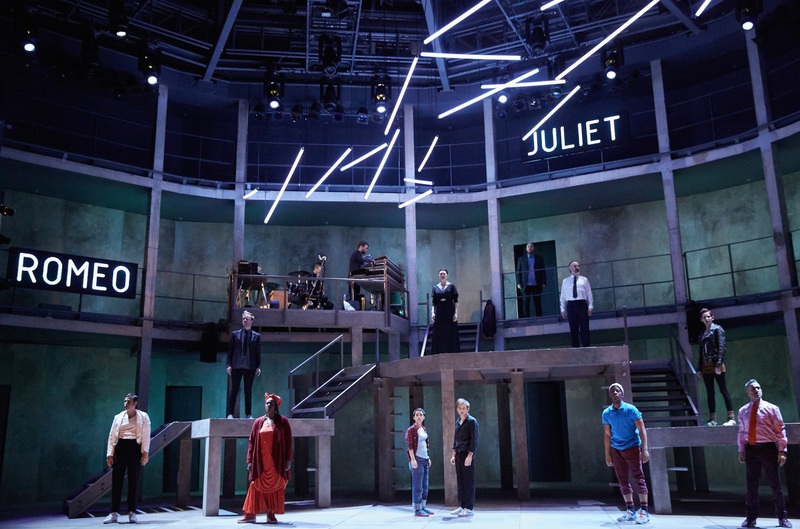 Blood pumping, wired, brutalist and for a skate board generation, Romeo and Juliet continues at the Rose Theatre, Kingston, until 21st March.